Definition at line 102 of file BTFDebug.h. Definition at line 160 of file BTFDebug.cpp. 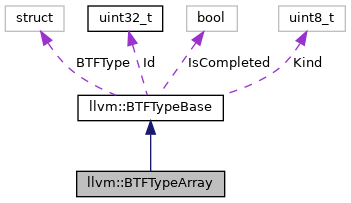 References llvm::BTFTypeBase::BTFType, llvm::BTF::CommonType::Info, llvm::BTFTypeBase::Kind, llvm::BTF::CommonType::NameOff, and llvm::BTF::CommonType::Size. Definition at line 171 of file BTFDebug.cpp. Emit types for this BTF type entry. Emit a BTF common type. Definition at line 180 of file BTFDebug.cpp. Get the size of this BTF type entry. Definition at line 107 of file BTFDebug.h. References llvm::BTF::BTFArraySize, llvm::BTFTypeBase::completeType(), llvm::BTFTypeBase::emitType(), and llvm::BTFTypeBase::getSize().